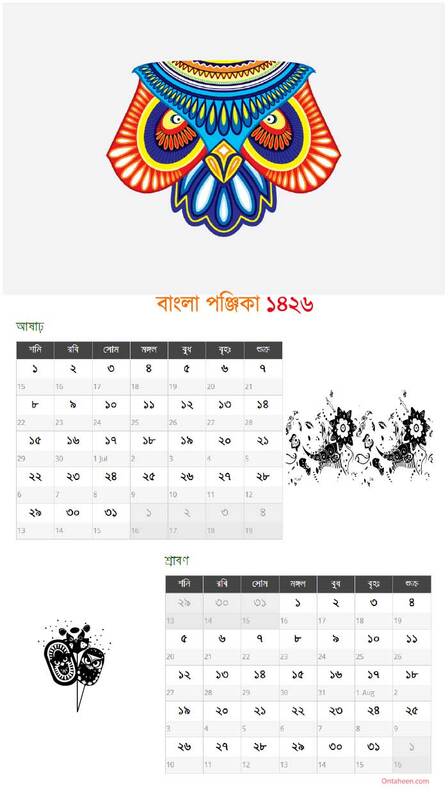 Bengali Calendar 1426 – Bengali Calendar is also known as Bengali Panjika. Bengali Calendar 1426 Covers the Christian Year 2019-2020. This Calender is a solar calendar. 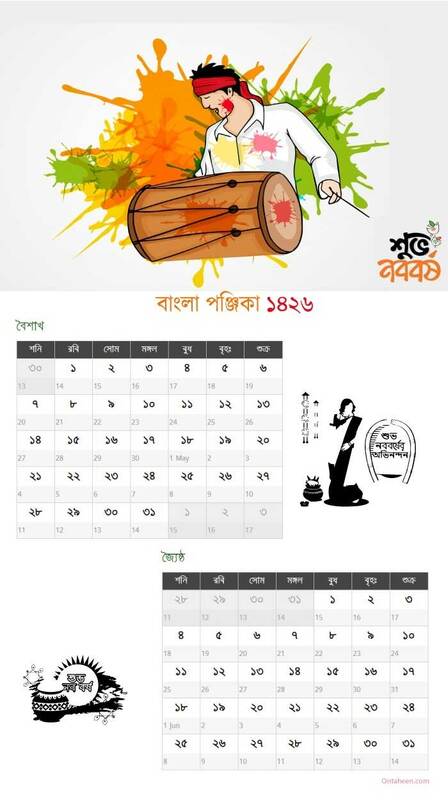 The official Calendar of Bangladesh is also the prime version of Bangla Calendar. 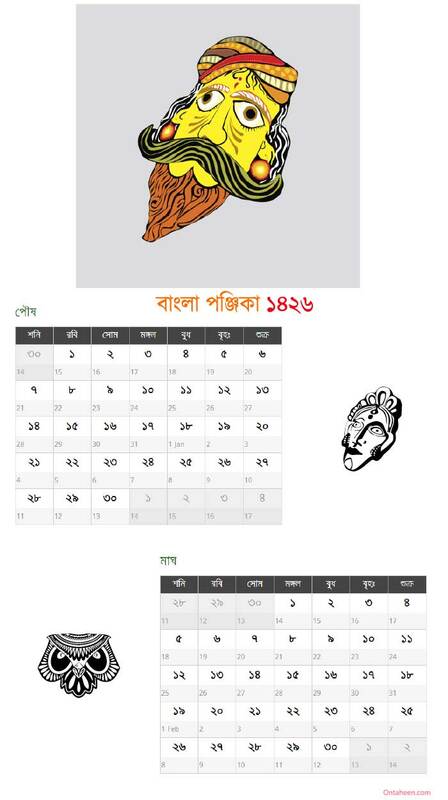 Before the adoptation of Bangledeshi Calender, People used West Indian Calender as Bengali Calender. 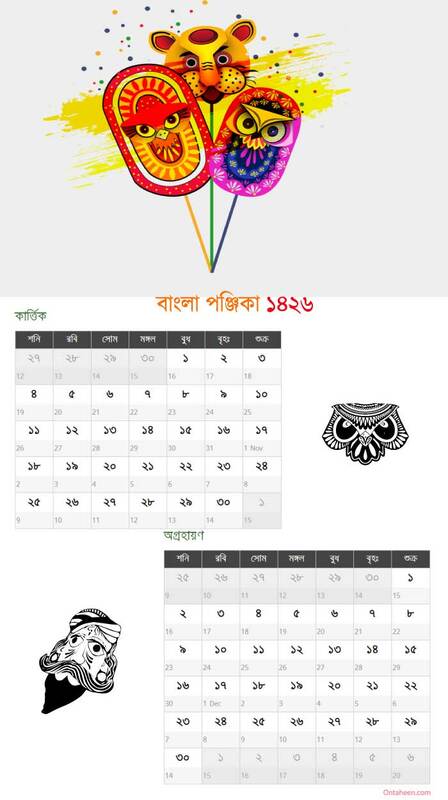 As we know that Bangla Calender has 12 month which are devided into 6 Seasons. 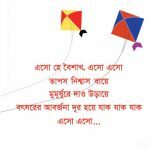 Summer or Grishsho starst with the Bangla first month Pohela Boishakh. The Word Pohela Means First. Therefore, 1st Boishakh is the first day of Bangla New Year. Summer or Grishsho covers the two month of Bangla Year. These are Boishakh and Jyoishtho. During this period , High tempature blows throughout the country. For this reason, Trophical cyclone like Kal-Boishakhi occurs. Boishakh is the first month of Bangla year. 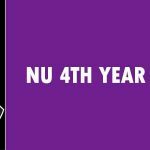 According to the Gregorian Calendar, April 14 is the First day of Bangla New year. There are several holidays this month. Pohela Boishakh which is the first day of Bangla new year is a public holiday. People throughout the country observe this day with great enthusiasm. This Month Covers April and May. Jyoishtho is the second month of Bangla Year. This is the last month of Grishsho or Summer season in Bangladesh. This month name after the position of Sun. This month covers May 15 to June 15. By the end of this month, the monsoon starts. Different Boishakhi Frouits like Mango, Jackfruit etc are available in the market. 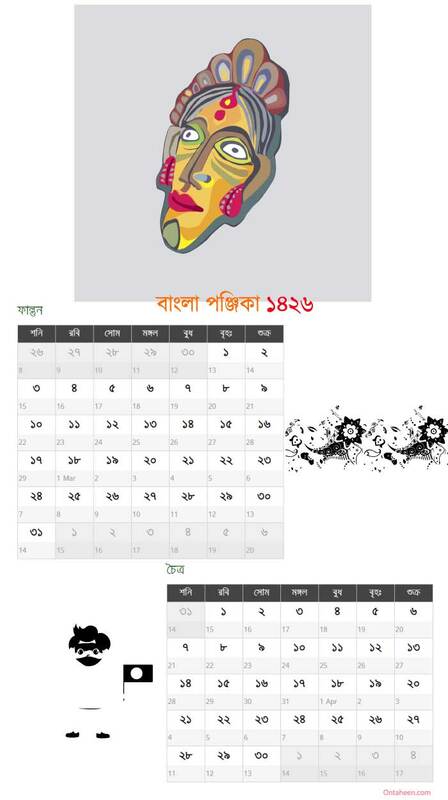 This the second season of Bangla Calendar. During this time there is heavy rainfall. This season covers the Ashar and Shrabon. According to the Gregorian Calendar, this comvers middle of the june to Midle of the August. In Hindu Virami lunar these Bangla two month is also name as Ashada, and Shraavana. During this season different flowers like Kadam, Kamini, Kea, Krishnachura, Cajuput, Gaganshiris, Nagaswaram, Minigiri, Segun, Sultan Champa, Swarna Chappa, etc are bloomed. Ashar is the third month of Bengali 12 Month. This is also the first month of the Rainy season. People of Hindu Religion has different occasion in this month. Usually, this Bengali Month Covers the June 17th to July 17th of Gregorian Calendar. Ambubuchi, Bipodtarini Puja, Monosha Puja, Ashtanag Puja, Ekadashi, Amabashya, Purnima etc are the major festivals during this month. 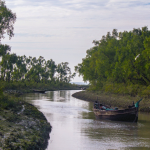 Badhra and Ashwin months covers the Autumn Season in Bengali Calendar. This is one of the four major seasons in the world and the third season of Bengal Solar Calendar. During this time, the days are shorter and nights are long. The weather gets cold during this time. In this time, Snowflake, Gagansiri, Ratim, etc flowers are available. In the year of 2019, August to October Month Covers this season. Ashwin is the seventh month of lunisolar Hindu calendar. It is the last month of Autumn. During this month new moon begins. Etymologically there is a belief that, this is the month of God-Vision. It overlaps September and October month of Gregorian Calendar. After the Autumn Season, Hemanta comes. Hemanta is also known as Late Autumn. Some people call it early Winter. Kartik and Agrahayan Months cover this season. After the Month of Kartik, farmers become busy with the new crops. During this time, A Traditional festival observed Nobanno. Nabanna is the festival of the first rice prepared from the new crops. October and November month corresponds Kartik month. It is the 7th Month of Bangla Calendar. The name of the month is derrived from the start of Krittika. Hemonto or Dry season starts from this month. Several religious festivals take place during the month of Kartik. 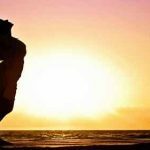 Some of these are Balipratipada, Govardhan Puja (Annakut), Bhai Dooj, Kartik Poornima , Sohrai, Kartik Ekadashi etc. Agrahayan Month is the 10th month out of 12 Month. It may call as Nabanna Month. During this month rice harvesting runs on. After the harvest of rice, Nabanna Utshab Runs on. Nabanno means new foods. New Food is prepared with new rice. Agrahayan month covers November 18 to December 18.
winter is the fifth season of Bengali Panjika. Poush and Magh month make winter season. During this Season, dew comes off. People around the country enjoy the winter Season. Traditional Bengali Food like Pita are made almost all the home. This season also named as Marriage season. Most of the Educational institutions are remained close during this time. During this time there is free time for all. So, most of the marriage ceremony occurs during this season. People love to make ta our in this period. So, tourist spots become more crowdy. After the Month of Agrahayana, Poush Comes. It is the ninth Month of Bengali Calendar which touches December and January of Gregorian Calendar. As it is the first month of Winter Season, There is the presence of dew in the morning. After the month of Poush, the farmer and people have food and money, So different festivals are observed during this time. One of the biggest festivals is Poush Mela or Poush Sankranti. This Mela is observed on the last day of Poush Month. 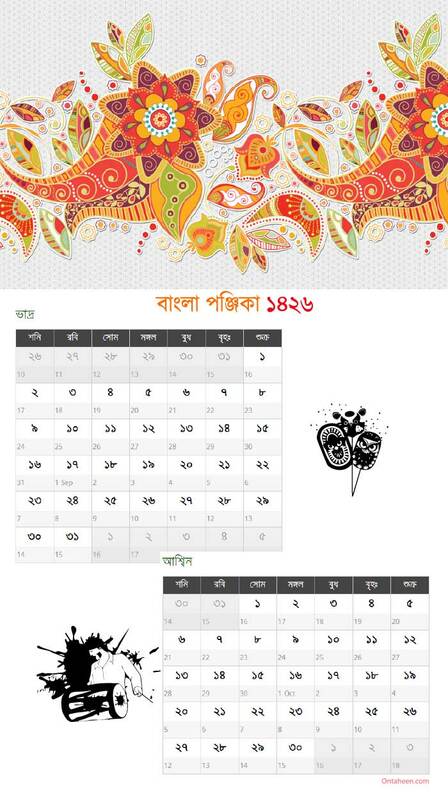 The Tenth month of Bangla Calendar which Covers January and February. The Month Magh after the name of Star Magha. This is the last month of Winter. Hindus observe Swarshoti Puja during this month. As Bangladeshi people have much diversification of Culture, there are many festivals occurs in this month. By the end of the month, Winter goes on. Spring is called the king of all season. During the Winter, All things including leaves to pond become dry. When the Spring Come, the flower start to bloom again. Green leaves everywhere. People around the world welcome the spring with different festivals. Falgun and Chaitra are the months of spring. On the First day of Falgun, Bengali speaking people welcome the spring. The program is known as Pohela Falgun. By the end of the Spring, people take preparation to welcome the Bangla New Year. According to Gregorian Calendar, February to April belongs to Spring Season. Falgun is the 11th Month of Bengali year. This is also the first month of Spring. During the time of Winter, everything become dry. In this time green leaves come out. The Flower started to bloom again. Falgun Started on 13th February of Gregorian Calendar. Chaitra is the Last of Bengal Year. By the end of this month, people take preparation to welcome the Bangla New year. Usually, Chaitra covers March and April. The last day Chaitra is 13th April. With the end of this month, Spring also ends. This is all about Bangla Calendar 1426. If you have any question regarding this then feel free to ask through comments.